I have a passion for chips and could eat the whole bag if someone doesn't move them away from me. I'm always looking for something salty that's a little healthier. These Hot Sticks fit the bill, are real easy and go over great at all our RV get togethers. You can leave out or modify the red pepper. 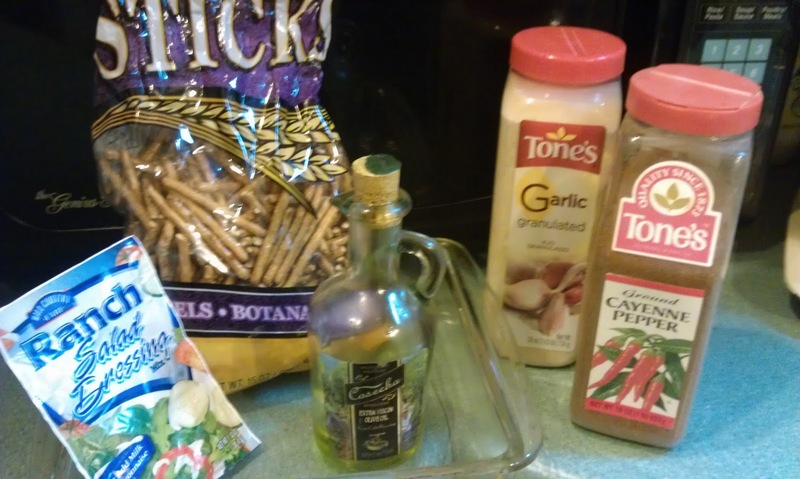 Combine all ingredients except pretzels. Place the pretzels in a shallow pan. 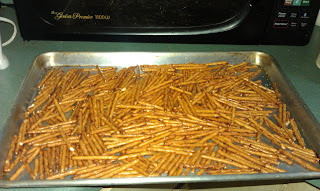 Pour the mixture over pretzels and mix until well coated. Bake in oven at 200 degrees for 1 hour. Note: I've also used other dip mixes besides Ranch dressing, like Cucumber cream, Mexican or Asian spice, etc. and all were great. I've also added other crispy munchies like chex mix or other bitesize snacks to the mix. Experiment with other spice mixes to vary the flavors. Yummy with just the right amount of spice.